❤ 1 dynamic driver earbuds, stereo bass and high fidelity. ❤ Magnetic Attraction headset, convenient and fashion. ❤ Half in ear hifi headphone, comfortable. ❤ All in one button, remote control and HD Microphone. ❤ 3.5 mm audio jack, compatible for most android and ios smart devices. ✪ KINBOOFI have the Formal authorization from original company , all products are original. 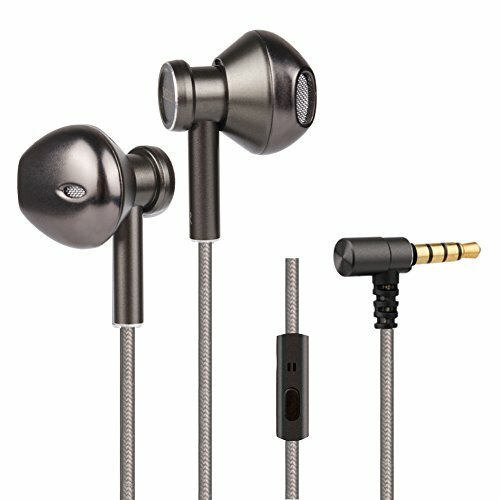 ✿ Whole Metal Housing Hifi Earbuds: V20 in ear headphone has a full metal housing which is forged by over 20 processes that is more corrosion-resistant, anti-aging and more durable than traditional plastic headphones. Provides 2 silicone eartips in package. ✿ Magnetic Attraction: The magnetic on this stereo bass earphone help keep them together and less tangled,easy to storage, also can wear them as necklace when walk out, fashion and convenient. ✿ Stereo Bass Wired Earphone: Special half in-ear headset, Sound Isolating Earphones, within whole metal housing and one dynamic driver, provides good listening experience and more bass. ✿ HD Microphone & 1 Button in-line Control: The built-in microphone eliminates exterior noise. 1-button in-line metal remote gives you the power to easily take and end phone calls, control music with a touch of a button, such as play/pause, skip or rewind music. Compatible with most IOS and Android smart devices with 3.5mm jack. ✿ 12 Months Warranty : Buy With Confidence. KINBOOFI has the authorization from original company, all of our product are original. You will get a 12 months warranty from the date of purchase if you order from KINBOOFI.